The Archives Department in the St. Tammany Parish Clerk of Court allows research into genealogy and vital records for the parish, including marriage records and more. The department contains records that date back to 1810, and they allow users to research for free, although they do charge a 50 cent fee to print records. To visit the Archives Department, go to the basement level of the St. Tammany Parish Justice Center, at 701 N. Columbia Street in Covington, LA., and to contact them by phone, call (985) 809-8746. 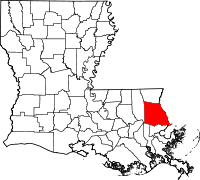 Due to its close proximity to New Orleans, St. Tammany Parish is the fastest growing parish in all of Louisiana, and with a population of approximately 264,000, it is one of the most populated parishes in the state, as well. The parish sustained heavy damage during Hurricane Katrina in 2005 with nearly 50,000 housing units taking damage from extreme wind, flood waters, or both.